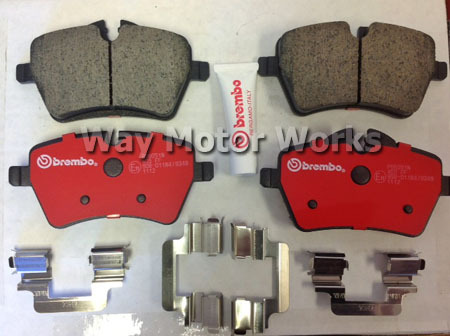 Brembo Ceramic Brake pads for 2005-2006 R53 Cooper S JCW, and 2005-2008 R52 Cabrio S JCW. With your John Cooper Works MINI these are good pads to improve performance and lower the brake dust without busting your wallet. Brembo known forever as being one of the top brake manufactures now is offering these ceramic brake pads. With the Brembo name we have to believe they are a quality product. These Brembo Ceramic pads are made to be quiet, low dust, and give good pedal feel. These Brembo Ceramic pads also have the slots in them for the OEM brake pad sensors to be used. The Brembo Rear Pads include Rear brake pad sensor and brake pad lube. Making the price even better. Front Brembo Ceramic Pad set comes with pads for both front wheels, new mounting slides, and brembo lube. 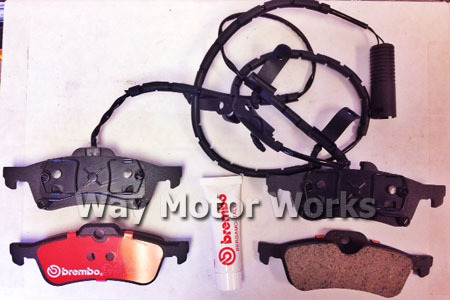 Rear Brembo Cermaic Pad set comes with pads for both rear wheels, brake wear sensor, and brembo brake lube.